Earlier this year, Camacho Cigars used viral marketing—and a giveaway—to promote three of its cigars. Labeled “The Black Band Project,” it featured three videos and three sticks. The project was, according to company marketing director Dylan Austin, a huge success. “It blew past our expectations,” he said, adding that the massive response was about 500% greater than they anticipated. Triple Maduro: An incredibly dark and oily stick with a nice nutty pre-light aroma. I had high hopes for this cigar. Unfortunately, it didn’t deliver, particularly because it kept scraping the back of my throat with a sharpness that I associate with tobacco that’s not ready for rolling. Corojo: This cigar was dark as well, though not showing much oil. It began with a pleasant charred taste that soon gave way to a sourness accompanied by a great deal of dryness and heat. Based on this example, using corojo tobacco for the filler, binder, and wrapper seems to be too much of what’s often a good thing. Connecticut: Like the Camacho Connecticut I smoked last month and the one my colleague reviewed on Monday, this was an interesting, satisfying cigar. The wrapper was flawless, the burn perfect, and the flavors complex and varied throughout. This medium-strength creation was easily the best of the lot. Whether this marketing effort will sell cigars, I don’t know. But it certainly provides an answer to those who complain that the cigar industry is too hidebound and hampered by tradition. I applaud Camacho for trying something different. And, while the giveaway has ended, you can still watch the videos and seek these sticks out for yourself to form your own impressions. I never received my cigars as promised even though I watched the videos over 2-3 months ago!!!!!!!!!!! You're not missing anything – the review is spot on. I imagine this marketing had a significant price to it, but it seemed to garner Camacho a significant amount of attention, so it must've been worth it. Mitch – They said the huge response slowed their ability to deliver the cigars. Hopefully, they'll eventually arive. The only way this 'project' would have been even slightly interesting would have been if they included other cigars apart from Camacho. If anything the whole thing put me off there cigars. Interesting commentary, many thanks for the article and for the feedback. You should get them soon. I actually got them 2 days in a row here. Got them yesterday and to my suprise a second box today. to the 90% of the cigar smokers in the world that they are wrong, Cuban cigars will rule, communist or not, they have always been and will continue to be the best. I have smoked and will keep on smoking other cigars from other cigar countries, I have nothing againist them. I have smoked your brand also, SO, what's so special ?? now,they are really scared, all those NC big shots who have been in control of the cigar market in the US for the last 48 years. All of their agressive marketing on how Cuban cigars ARE not the best cigars, BUT are always ready with the ,Our cigars are made by cuban rollers, Our cigars come from cuban seeds, Our cigars have that cuban taste & style, Our cigars are Habanos outside of Habana. Then comes their own propaganda, Don't put your money in Castros pocket, Don't support the commies, the Cuban cigar that you're smoking is made by an angry commie, etc .etc, Our cigars are the best in the world, little did the Americans know at the time, that the NC market represented only 10% of the world market and only in the US. They have , for years, misinformed and misguided the uneducated cigar smokers in America. marketing because,now, they really want to scare YOU into buying their cigars. and going from Europe to the US. I stand by what I've said . There is no intent to insult anyone in my remarks, It's just that I'm sick of all these false info and misinformation that the cigar smoker in the states is recieveing. The videos are quit amusing but behind all that there is a true message of fear on their part. thank you for reading me out. I too was disappointed by the BBP cigars. The corojo was good, the triple maddy OK and the CT didn't do anything for me. 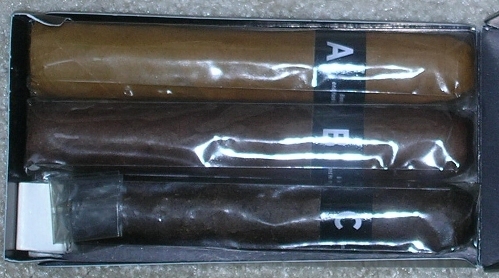 I will say that I'll likely try the CT again based on great reviews from a lot of BOTL with a similar palate to mine.